Winter has a solid grip on us here in Southern Ontario. Even though I hate winter, I do like watching the snow fall when it’s quiet and dark outside. So I tried to incorporate some of that peaceful stillness in my card. Our challenge this week at Crazy 4 Challenges was to use groundhogs in honour of Groundhog day or, if you don’t have any, use another small critter that lives on or in the ground. I recently bought Winter Time Fun by Hero Arts so the critters in there are perfect for this challenge. I couldn’t decide what medium to use to colour them in. Do you ever have that problem? I finally decided that my coloured pencils could use some love as I hadn’t used them in a while. So if you enlarge the photo and notice some of the black lines aren’t all that dark, that’s why. I decided that the deer would be a reindeer. Did you know that most deer except female reindeer lose their antlers in the winter? I only learned that recently! I had to look up what they look like of course, I think we have reindeer in northern Canada but I’ve never been north enough to see them. I chose a red fox for some additional colour. I used two colours for the tree and added some light blue to soften the snowy areas. Then I used orangey reds for the cardinal and warm greys for the raccoon. Now that I see it enlarged, I covered some of the black lines here too. But I really don’t mind. The background was done with Distress inks over the masked images; the snowy hill was masked too with a simple hand cut mask made of plain printer paper. So now to add a sentiment. I was thinking of a large scripty font but when I placed the clear stamp in the sky, it overwhelmed the small images and made the sky look cluttered. I finally decided on a small simple sentiment at the bottom which kept the calm look intact. 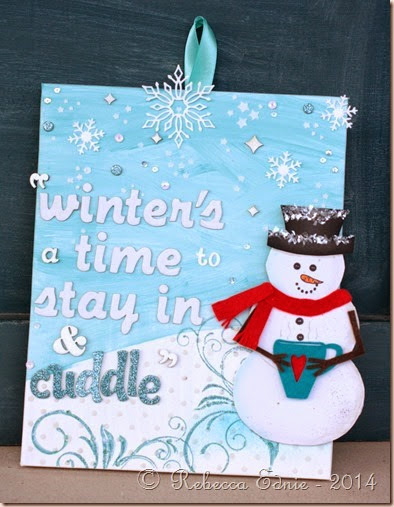 While you are staying indoors staying warm, I hope you will pop on over to the C4C blog to see the other designer’s creations and join us! …blog hop benefitting The Coffee Oasis. I can’t imagine being homeless especially in winter and more especially as a child or teenager. So I’m happy to support and donate to this good cause. Anyone can join so click on the graphic above to learn more. I layered a lot of die cuts and stickers that matched the Simple Stories patterned paper. 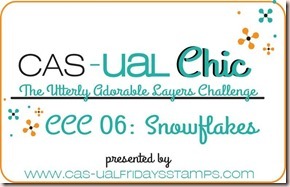 The only stamping is the snowflake pattern (by MFT) at the top. To make it fade out without a hard line, I inked the stamp at the top only. Then I used my ink blending tool to remove some of the ink along the edge. Then I stamped it while keeping part of the stamp up in the air. Between these two techniques, I got the look you see here! Then I just added a twine bow at the bottom and some sequins to finish the card. I just love polar bears. I know I posted before about their colour in this post but an artist can do what she likes right? So these ones are shaded with grey rather than yellow/brown. It matches better with the colours of this card. This card is based on a sketch at Crazy 4 Challenges this week. I omitted a small banner across the bottom of the circle. Well, it isn’t really so much omitted as it is hard to see. The polar bear is standing on a snowy ridge but you can’t see it for all the shaker bits. I used Distress inks (some regular and some Oxide) and a gel pen to add snow. I actually did two of these cards, the other one also included some glass glitter in the shaker. When I use glass glitter vs regular glitter, it doesn’t tend to stick to the acetate but for some weird reason it stuck this time. The static often subsides after a while so if you’ve made a shaker with glitter and it obscures the scene or sentiment inside, it may work out in the end. But for a polar bear card, it makes it look like he’s in a blizzard which is very appropriate! This card uses snowflake confetti, silver glass microbeads and two sizes of silver stars. The sentiment is from PTI Two Feet Deep and the bear is by Hero Arts. I have the matching dies but if a shape is simple enough, I tend to cut it out to avoid the white edge. Wouldn’t it be great if dies would cut the stamped image out perfectly?? 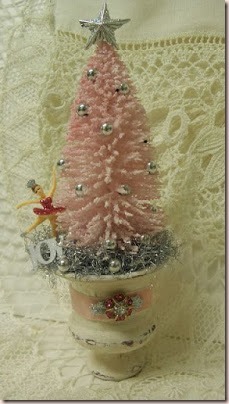 The little tree is by Impression Obsession and the confetti bits are by Lucy’s Cards. The stitched circle is by Simon Says Stamp. 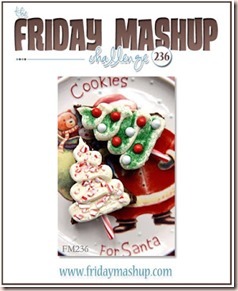 I hope you will join us over at Crazy 4 Challenges this week! 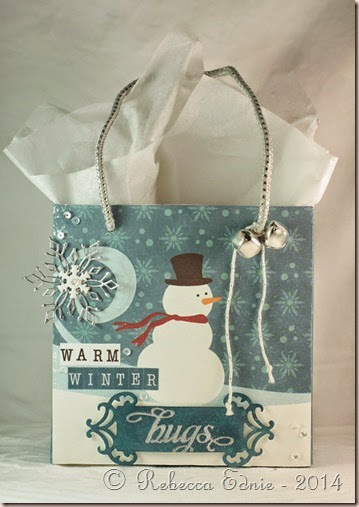 It’s getting to be a busy time of year but you will be making cards or tags anyway right? So use this sketch to help you out and save some time! 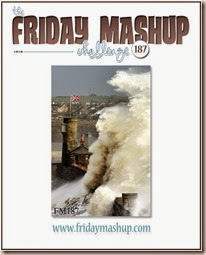 Welcome to another The Shabby Tea Room Challenge! WE have a FABULOUS inspiration photo for you this week! I know it’s a busy time for most people but I hope you can join us! I stamped the background with some tone-on-tone sketchy snowflakes. I’m afraid it’s very hard to see. 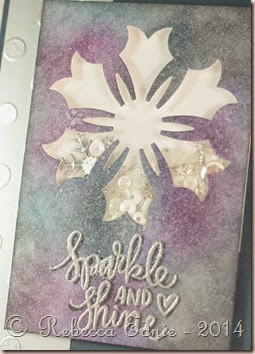 Then I swiped the edges across my Versamark ink pad and sprinkled on some white embossing powder. It looks like that snow stuff stores spray on the corners of their windows in the winter. The card base was sponged with tone-on-tone ink as well using a diagonal stripes stencil. The sentiment was heat embossed with platinum embossing powder. The wreath was formed from pine branch die cuts covered in silver and aqua glitter. 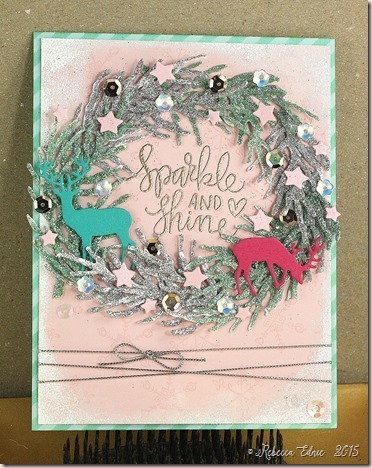 I added lots of pink star confetti die cuts the two deer and lots of sequins. Last but not least I added the silver string. You can see the sparkle somewhat but it’s so amazing IRL! Isn’t this photo lovely? I wish I’d had a ballerina to use for mine! 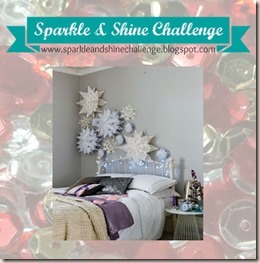 So head on over to TSTR and take a look at the super talented gals projects! So much wonderful inspiration! You can post any kind of crafty project in any style! Be inspired by the tree, the holidays, the colours, the lace or the ballerina! Or something else I missed! Be sure to leave the design team some love while you are over there! Whew! That’s quite the title huh? 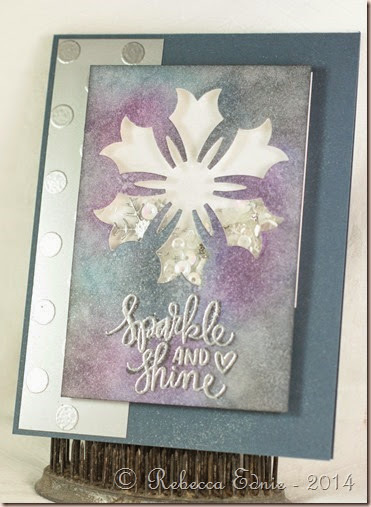 I recently watched a video by Jennifer McGuire about making a shaker card with a sponged background. I decided to CASE her idea. I used extra thick foam underneath so I’d have lots of room for shaker goodies. I always overfill so I gave myself some more room. There’s clear, white and a few silver sequins, microbeads and tinsel glitter. I also tossed in a silver embossed snowflake die cut I made for another project and didn’t use. My silver embossed sentiment didn’t show up too well against the shimmery background, should have used white, so I shadowed the letters with a dark grey Copic marker. 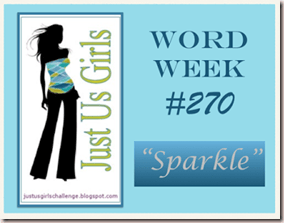 I’ve made this for a few challenges: Mojo Monday 375 and the JUGS challenge #270 “sparkle”. 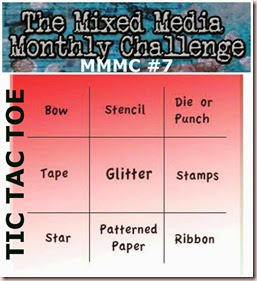 I’ve seen so many cards based on this month’s Simon Says Stamp card kit, it was hard to come up with something original. I think I’ve done a pretty good job. I used the sequins from the kit along with a few other gold and white ones from my stash and I added some chunky gold glitter too. I loved the little heart border so I used it on my vellum shaker. The thread is gold though it’s hard to tell right now. I actually used two layers of vellum then adhered the shaker pocket to the card base. Not sure if that was the best idea because it buckled somewhat even though I held it closed with paperclips. 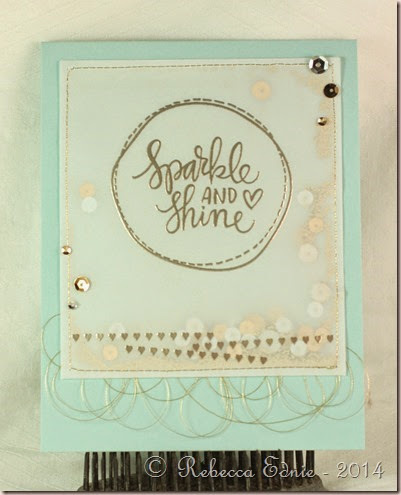 I saw Jennifer McGuire do a similar card (after I made mine) and she sewed one layer of vellum right to the card base. Maybe next time!